1.We are capable to produce castings up to 25 tons. We are capable to produce castings up to 25 tons weight in all kinds of materials for wear and heat resistance with 30 tons electrical furnace. In the recent 20 years, our liners have been widely used in large, medium and small ball mills in Chinese power generation, mining, cement, Chemical engineering and metallurgical industries and super fine pulverizing equipments. 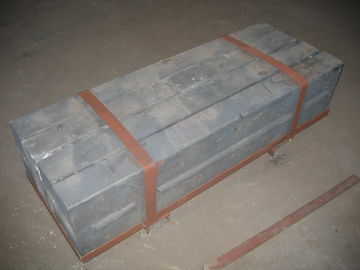 It is the only recommended liner product in the latest standard of the electric-power industry in China. Our foundry has complete melting, heat treatment and test equipments, such as mid-frequency induction electrical furnaces, quenching and tempering furnaces, blast shot, spectrometer, Rockwell and Brinell Hardness tester, impactor, UT tester and metallographic microscope. 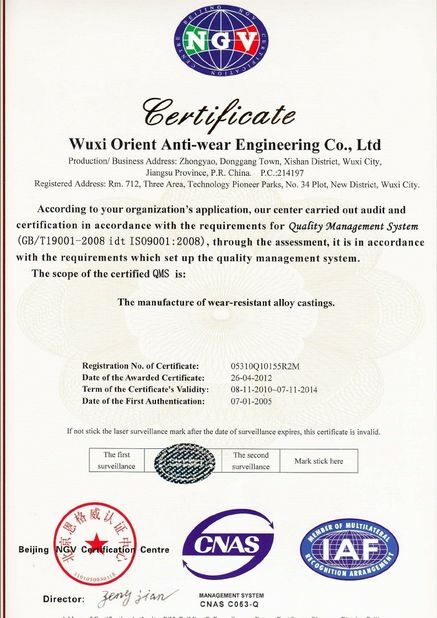 We achieved the certificate of quality management system ISO 9001:2008. We have been exporting castings to oversea markets, such as Brazil, Australia and South Africa.